Fast food apps are increasing in popularity. Not only can they save you time, and help you avoid the hungry crowd with mobile ordering, but they can also save you money. Sure, fast food is known for being affordable, but fast food apps can actually help you score free food. And who doesn't love free food? Of course, the best way to save money on fast food is to avoid it altogether and cook all your meals at home, but we live in the real world of unexpected traffic and busy schedules, and sometimes you need to grab something quickly. All of these apps allow you to order ahead of time to skip the line when you pick up your food and offer rewards for discounts and freebies. Bonus! Here are our favorite 20 fast food apps and the delicious perks that come with them. My local BJ's always has a wait of about 30-40 minutes on weekend nights. Luckily, with the app you can put your name on the waitlist before heading to the restaurant and cut down on wait times. The app also rewards members with a free mini pizookie (a pie and cookie hybrid, usually served with ice cream) when they sign up, and orders earn members one point for every dollar spent. Once you have earned 100 points, you will receive a $10 off coupon good for 90 days. The Burger King app promises $30 worth of food coupons once you sign up, but in reality, it's BOGO free coupons and other discounted meals. You can also connect your PayPal account to the app for faster payment. The Café Rio app rewards users $10 credit for every 100 points they earn. Usually, you will earn one point for every dollar spent, but many times the app will also reward double points. And your rewards don't expire. I love the Chick-fil-A One app because it's always rewarding me with a free food item. Sometimes it's an ice cream cone, other times it's a salad. The app will also give you rewards for using the app to pay for food directly. Chronic Taco adds 50 points to your account right when you sign up. You will also earn one point for every dollar spent at the restaurant. Just 25 points can be redeemed for an order of churro bites, 50 points for a taco, or 100 points for any menu item. The Coffee Bean and Tea Leaf app offers a free coffee or tea at sign-up. The app also gives app users a free birthday treat and reward points for every purchase you make (a point for every dollar spent). Redeem points toward free drinks and food items. You'll even unlock certain freebie levels (Purple, Platinum, and VIP) with regular use. 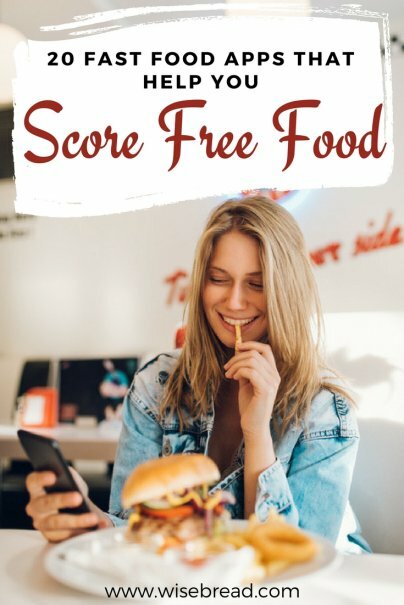 Earn $10 of free food through the LOCO Rewards every time you earn 100 points by scanning the app, either at the drive-thru window or ordering through the app. You also score a free entree worth up to $7 at sign-up. Each dollar you spend at El Pollo Loco is worth one point, and soon, you will be able to load gift cards straight to the app. As soon as you sign up for the Firehouse Subs app and reward program, you will earn a free large drink, and then a free sub on your birthday. You will also earn one point for every $0.01 you spend, which can be redeemed for free subs and salads. The Jack in the Box app offers special in-app offers like two free tacos with any purchase or 10 percent off your order. You can also save your favorite order for quick and easy one-tap ordering. Jamba Juice gives new users $3 off your order once you activate your account. You'll also earn a free treat for your birthday, and a $3 reward for every 35 points you earn. Did someone say free doughnuts? Sign up for the Krispy Kreme app to receive a free Original Glazed doughnut upon registration and on your birthday. You can also earn free boxes of doughnuts and beverages after so many purchases, which is a nice bonus if you're in charge of snacks for your office or child's school. Compared to other fast food chains, McDonald's offers coupons and rewards on their app that are quite decent for lovers of fast food or those who find themselves in a dinnertime pinch. The app gives you instant access to food coupons, like $2 off a Signature Crafted sandwich through mobile order and pay, or free fries with any purchase on Fridays. Additionally, McDonald's also offers McCafe rewards, which allows you to earn a free McCafe drink after purchasing five — no size limits. MyPanera Rewards gives members rewards for three things: for their birthdays, for spending, and just because. There have been months when the app rewarded me a free coffee or a free bagel for every day of the month — no additional purchase necessary. I also like that the app rewards a free food reward after so many visits, not based on how much money I spent. Every dollar you spend at Pick Up Stix will earn you one "Fortune." After you earn 100 Fortunes, you can redeem them for a free entree. Sign up for the app through Facebook to receive free Fortunes. PizzaRev fans can earn one point for every dollar spent through the app. Once you earn 100 points, you can redeem them for a free pizza or entree salad. Rev Rewards members also receive free treats on their birthday. Eat fresh and earn tokens for every purchase you make at Subway. Earn 100 tokens, and you will be rewarded with a $2 off coupon. You will also earn bonus surprises, such as a free cookie on your birthday. This app also has surprise deals that can be redeemed through your phone. The Whataburger app rewards you based off visits rather than the amount of money you spend. If you use the app on five separate visits, you will have your choice of a free honey butter chicken biscuit, medium French fry, taquito, cinnamon roll, or a small shake on your next visit. Sign up for Yogurtland’s Real Rewards program to earn an initial free three-ounces for registering and another free three-ounces on your birthday. You earn a point for every ounce purchased. Yogurtland’s reward program is tiered (Green, Raspberry, and Platinum), so once you earn 60 points, you can move from Green to Raspberry and earn three-ounces free for every 36 points earned. Obviously these apps were created to get you to spend money on fast food in order to score free food, but here are three ways you can spend less and still get rewards. Look for discounted gift cards on eBay and other reputable gift card sites to save a small percentage on your fast food budget. Load that card to your account and earn points through the app. Warehouse clubs, like Costco, also offer discounted cards to Jamba Juice regularly. Sometimes these restaurants will offer a deal like, "Buy $X worth of gift cards get a meal or drink for free." You can buy the gift cards to get the free item in one transaction and then load the gift cards on the app in order to keep earning rewards without spending more money to do so. You usually can't combine coupons in a single transaction, but luckily, several fast food places are fine with you having separate transactions in order to take advantage of more than one coupon.